Subtle differentiation from other members of the Taurus family starts up front, with a performance-inspired grille in black mesh – unique to Taurus SHO – flanked by series-specific high-intensity discharge headlamps. Behind the front wheel openings, a fender-mounted scallop contains a subtle SHO badge. 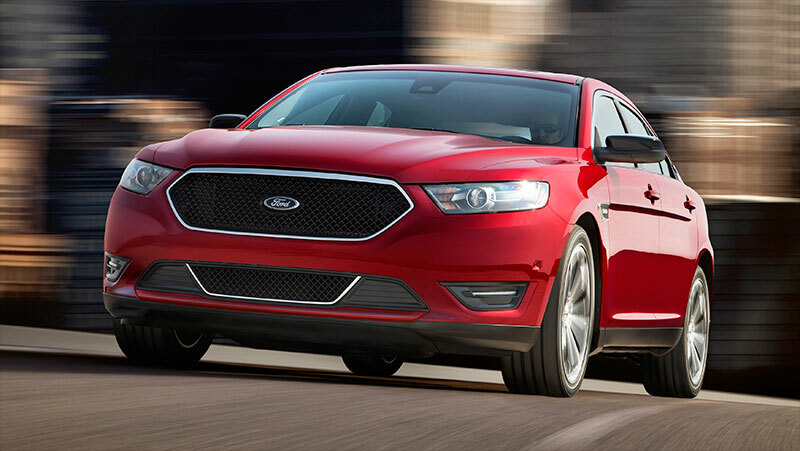 For 2015, Taurus SHO is available in three new color options – Bronze Fire, Magnetic and Caribou. Twenty-inch premium machined and painted alloy wheels wearing P245/45R20 all-season performance tires are standard for 2015, giving SHO a muscular, athletic look. SHO-specific sideview mirrors – also in contrasting black – are heated, have memory functionality and contain downward-facing puddle lamps; the driver’s side features auto-dimming. In the rear, Taurus SHO features a unique decklid-mounted spoiler. Inside, Taurus SHO communicates its sporty characteristics with a perforated leather-wrapped steering wheel, leather-trimmed sport seats with embroidered SHO graphics, unique woven aluminum trim and adjustable aluminum pedals with memory. 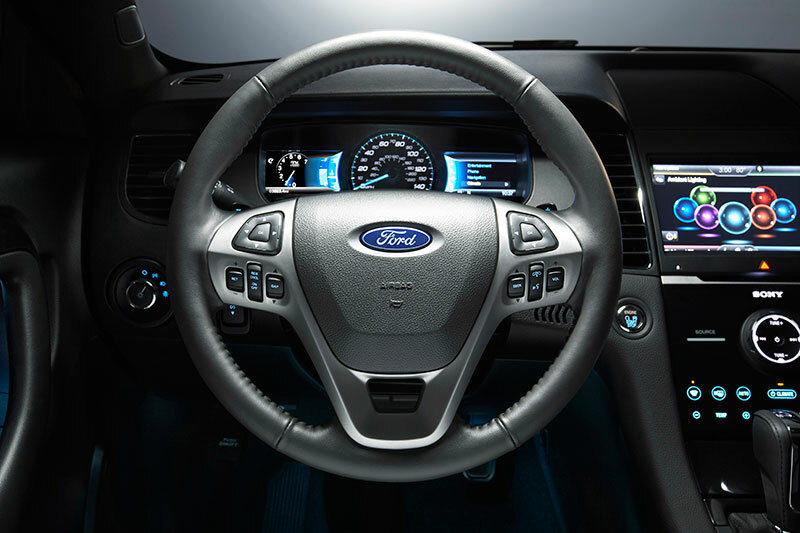 Signature Ford technology is a key attribute of Taurus SHO, with the addition of standard MyFord Touch® driver connect technology powered by SYNC® and the replacement of several traditional knobs and controls with clear, colorful LCD screens and five-way buttons. The screens can be personalized to display information relevant to each individual driver using voice command, a simple button click or touch-screen tap. Taurus SHO continues to be one of the most advanced full-size sedans on the road with features such as the available lane-keeping system, which uses a digital camera mounted on the windshield ahead of the rearview mirror, allowing the car to watch the road ahead to detect an unintentional lane departure. The Ford lane-keeping system has three levels of assistance available to the driver depending on what is happening: lane-keeping alert, lane-keeping aid and driver alert. The driver must turn on the lane-keeping system. Once the vehicle speed is above 40 mph and lane markers are clearly visible on the road, an icon that looks like a car between two lanes lights up green in the instrument cluster to indicate the system has been enabled. Ford’s lane-keeping system takes advantage of the Taurus SHO’s electric power-assisted steering to provide a vibrating alert to the driver and then gently steer the car back into the lane if the driver doesn’t respond. The Taurus SHO drivetrain continues to use the award-winning and fuel-efficient 3.5-liter EcoBoost V6 engine, delivering 365 horsepower and 350 lb.-ft. of torque, mated to a six-speed high-capacity 6F55 SelectShift®Automatic transmission. Steering wheel-mounted paddle shifters enable Taurus SHO to match revs for smooth, quick, manually selected downshifts. SHO dynamics are enhanced over other Taurus models with larger brakes, Torque Vectoring Control – using slight braking to provide the effect of a limited-slip differential – and unique sport-tuned suspension. Taurus SHO is produced at Ford’s Chicago Assembly Plant.